It is very important to consciously change the diet with the seasons. And you may as well make it delicious while you're at it. When Weston A Price studied healthy indigenous populations around the world, he discovered that all traditional cultures with radiant health learned to eat with the seasons, and change their diets according to the evolving needs of their bodies in relation to external changes. Many cultures upped their probiotic intake in winter in the form of fermented dairy and vegetables (such as kefir and sauerkraut) to ignite digestive fire and aid in the breakdown of complex foods such as red meat. Many also increased their caloric intake - of fats especially - to raise their basal metabolic rate and increase their resting body temperature to promote the movement of energy in the body. In Ayurveda, it is said that Vata and Kapha can easily become aggravated in winter. Vata imbalance symptoms are numerous, but given that it is the dosha governed by air and ether, some that you may experience in winter are dry skin, dry and painful joints, increased pain in general, localised numbness, cold hands and feet, and a dryness of the eyes and mucous membranes. If your Kapha gets aggravated in winter, it is easy for you to succumb to cold, wet conditions such as chest infections, sluggish digestion, sinus infections, weight gain, skin congestion and a continually runny nose. While one set of symptoms are 'dry' and the other 'wet', both share the common quality of cold, so it is easy to see how these symptoms can become aggravated in the wintertime. If you do tend to have an increase in either of these qualities during the colder months, it is extremely important to consume warming foods that promote hydrochloric acid production in the stomach and ignite 'agni' or digestive fire. With less fresh produce historically available in winter, it is particularly important to take extra care to invigorate digestion in the colder months using a variety of medicinal and culinary herbs and preparations. Ginger is a fantastically warming spice and can increase peripheral circulation as well as aid in the digestion of dense meals. It also has an anti-inflammatory effect, which is important in times of cold when the joints can become dry and inflamed. Cumin is considered 'tri-doshic' in Ayurveda, which means that it is balancing and soothing to all three dosha's - Vata, Pitta, and Kapha. It is also known to ignite 'agni' or digestive fire, which is very important in winter. Cumin is generally invigorating, and helps the body to flush toxins, which can become stagnant in the system in colder months. This winter stagnation is why many traditional cultures used the bitters of early spring (such as dandelion) in conjunction with a brief fast to cleanse the body of the toxic build-up and to reinvigorate the system. Vitamin A is extremely important throughout winter as it is a fantastic promoter of immunity and also an excellent blood purifier. The vitamin A found in carrots (and all plant sources) is not true vitamin A and actually a caratenoid (beta-carotene in the case of carrots). The healthy gut is able to convert beta-carotene to true vitamin A, however if there is any kind of gut dysbiosis or amino-acid deficiency, this conversion often does not take place and the caratenoids are not utilised. For this reason, it is important to include plenty of true vitamin A in the diet alongside the caratenoids, particularly in winter. True vitamin A is only found in animal products, and is richest in egg yolks and liver. Coconut is generally considered to be cooling and even aggravating to Kapha, so if you feel your kapha is already aggravated then perhaps leave out the additional coconut cream for garnish of this recipe (as I would). Although its "cool and wet" properties have led many to believe that coconut cannot be consumed by kapha-types, coconut oil has actually been shown to raise metabolism and assist in thyroid function, making it an important part of the kapha diet in moderation. It is also a very helpful oil for the other doshas as it can pacify pitta and provide the necessary comfort and oileation for vata. Coriander is generally considered to be mildly cooling, however it is a fantastic remedy for colds and flues so should not be avoided in winter. Also, it tends to flourish and be in season in winter and so I believe this is probably a good time to eat it, in spite of its cooling properties. Nature does not make mistakes! I probably don't need to explain why chili is warming - I think everyone has experienced its effects! As with many of the warming spices, it is very anti-inflammatory and can soothe joint pain which can become unbearable for some in winter. Garlic and eschallots are wonderful for the respiratory system and should be used generously throughout winter to prevent coughs and upper respiratory infections. Bone broth. Ok. Anyone who knows me knows that I am mad about bone broth. It is absolutely life-giving and loaded with many minerals that it are very difficult to find in adequate amounts from other dietary sources, such as iodine. It is also loaded with collagen, elastin, and glucosamine which help to rebuild our own connective tissue and can be extremely soothing for dry, aching or inflamed joints. It is also rich in gelatin - particularly if the animal's heads or feet are added - which is a fabulous digestive tonic and draws enzymes towards itself, making it a wonderful aid to digestion and necessary for anyone with depleted hydrochloric acid production in the stomach. Gelatin also coats the lining of the stomach, making it a vital healing tool for those with leaky-gut syndrome. It is considered that a good broth can "raise the dead". It is very easy to make and simply involves bringing bones, vegetables and vinegar to the boil in enough water to cover them, skimming the scum from the surface, and then adding some woody herbs and allowing to simmer on very low heat for anywhere from 12-36 hours. Then you simply strain and allow to cool before refrigerating. I think I have rambled for long enough about the nutritional merits of this dish... hopefully you can appreciate why this recipe is the perfect warming winter recipe - both grounding and uplifting at the same time. 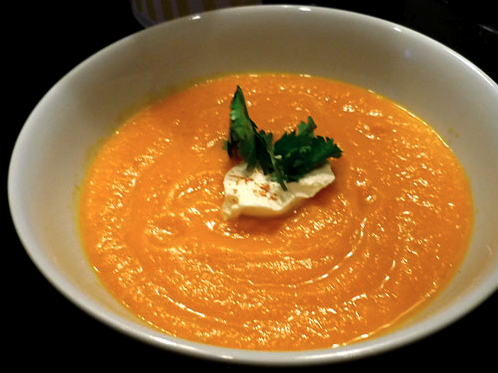 The liberal use of broth in this soup makes for a smooth, creamy texture and the fact that the carrots are roasted adds a beautiful richness to the soup that you simply couldn't achieve with boiled or steamed carrots. The heating spices add a wonderful aromatic quality to this dish and the coconut contributes to the subtle sweetness imparted by the carrots. This really is one of my favourite winter soups, incredible simple and seriously tasty. Chop the carrots into finger-sized pieces and roast in a 180C degree oven with the honey and cumin for 35-45 minutes or until they are tender but not overly soft. Fry the eschallot, garlic, chili and 1 teaspoon of the ginger in the coconut oil and season with salt and pepper. Once the eschallots, garlic and spices are fragrant and translucent, add the carrots and allow them to be coated with the oil. Add the bone broth and simmer for a further 5 minutes. Turn off heat, add remaining ginger and blend with hand blender or in food processor. Serve with additional coconut cream and coriander if desired.